At Budget Blinds of Murfreesboro, we're your local neighborhood experts that truly understand your needs. We're in your neighborhood, we know the local Murfreesboro weather and community, and we’re backed by the #1 provider of blinds, shades, and drapes in North America. Over 25 years of customer satisfaction gives you peace of mind that only comes with choosing the proven leader. We bring the showroom to you in Murfreesboro. We expertly measure your space, install beautiful window treatments, and back it up with the best warranty in the business so you can sit back and relax in the beautiful, Murfreesboro weather and sunshine. We serve to give you the best in window treatments, so you can rest easy knowing your space will be beautified and optimized with window treatments that fit your individual needs. Window coverings may be our job, but building relationships is our passion! The greatest reward of all is seeing the satisfaction on a client's face when an installation is completed! Hello, we’re glad you’re here at Budget Blinds of Murfreesboro! If you’ve been thinking of upgrading your home’s décor with stunning, new custom window fashions then you’ve come to the right place. That’s because our expert team is backed by America’s #1 provider of custom window fashions. As a locally-based and family-owned business, we are members of the Rutherford County Chamber of Commerce and also BNI Top Producers. Our highly trained design consultants come to you in the comfort of your own home with our FREE design consultation. And we’ll create and design expressive window fashions that complement your existing interior and furnishings beautifully. 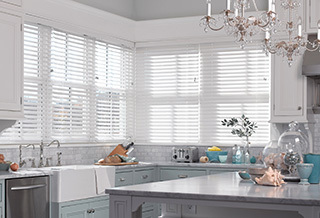 From value-priced and versatile blinds, to shades, genuine wooden shutters, and elegant drapery, we’ll transform your home’s décor into something truly special. So whether you’re near The Square, MTSU, or another area of Murfreesboro, let our unique, personalized approach to creating home décor magic elevate your windows and your life. You know your windows have been talking to you and asking for Budget Blinds of Murfreesboro, and you also know we had you at “hello”, so call or click today and schedule your FREE in-home design consultation. We love our new blinds and vertical! Budget Blinds of Murfreesboro was professional in the consultation/installation and our coverings came in quickly. We love our new shutters! Budget Blinds was able to match our stained wood trim and the installation was professional and fast. Great job!!! We wanted shutters for our entire home after renovation but would have to do it in stages. Budget Blinds was happy to work with us and now that the first stage is installed we can't wait to get the rest done! Informative consultation, professional installation, the highest quality products, and the best warranties around!!!! !